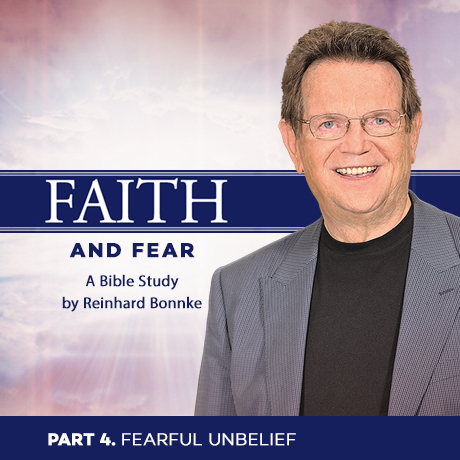 The Bible’s greatest illustration of fearful unbelief and fearless faith lasted forty years. It was like watching a forty-act drama on the stage, depicting the total bankruptcy of faith. We still see them in our mind’s eye—those camp¬ing tribes of Israel. Many a time their wanderings took them close to the border of the Promised Land. The problem was not that they did not believe they could go over. They knew it was their right, for God had given the land to them. They were thoroughly convinced. Their faith that far was perfect, but their faith had a fatal flaw—the worm of fear was at the heart of it. Their faith was useless while they feared, which is why most of them never reached the Promised Land. They panicked. They murmured about their lot but did not have enough faith to change it. They whined when they could have dined. The episode of the spies resulted in ten of them unbelieving and two full of faith. This is probably a normal average—two out of twelve believe and get what God has for them. The rest wish and die. The Marxist communists used to mock religion saying, “Work and pray, live on hay, and you’ll get pie in the sky when you die.” They promised pie on earth, but it never came. Those who are promised pie in the sky and believe what Christ said are the ones who find God gives them pie now, and then they do their best to make sure that other people get some pie as well. Depression When Jesus said, “Do not be afraid; only believe” (Luke 8:50), it was a pro¬found analysis of this emotion. Normally we say, “Do not be afraid, be brave, have courage!” Jesus did not say just, “Do not be afraid.” He knew very well that fear is part of man’s make-up. He said, “Do not be afraid; only believe.” During periods of melancholy when, as Scripture says, “neither sun nor stars appeared” (Acts 27:20), trust in God is the anchor of the soul. “Whenever I am afraid, I will trust in You” (Psalm 56:3). That is the time to trust. Unfortunately, some are by nature nervous and prone to depression and even panic. We see this is many famous examples from history, such as Tchaikovsky; Thomas Carlisle, the eminent author; and William Cowper, the poet and author of the famous Olney Hymns. Even the prince of preachers, Charles Spurgeon, knew the grip of depression and would make his students laugh because otherwise he said he would weep. The writer of Psalm 42 may have been temperamentally afflicted in the same way, but again faith came to his aid. He said, “My tears have been my food day and night…why are you cast down, O my soul? And why are you disquieted within me?” He seems to have no rational explanation for his depression. However, he knew where to get strength. He spoke to himself, “Hope in God, for I shall yet praise Him” (Psalm 42:5). Faith Is Not a Feeling This illustrates a major lesson—faith is not a feeling. When danger comes, fear is inevitable. When our bodily chemistry sets up a sense of impending disaster or we suffer heavy blows and our circumstances are oppressive and dark or when pain and illness sit with us at the fireside—fear and alarm come as a natural cause and effect. What then does faith do? It takes the shackles from our ankles, and we challenge their paralyzing grip and go ahead anyway. With God, fear will not stop us. We overcome. If we are believers, nothing can alter it, no matter what hammers and bruises us. Jesus said His followers were to give their lives for Him, but “not a hair of your head shall be lost” (Luke 21:18). You—the real you—believes God. The sea’s surface is ruffled, but the depths are still. Faith operates with¬out emotional reactions. It secretly imparts strength of mind and peace of spirit, so you do not go under but over. Faith gets us off the hook of fear. Faith is not just for Sunday but for life. Faith is not just for transplanting mountains (see Matthew 21:21) but for living. God gives us grace to live, if we believe, and the just will live by faith. Faith is the plus of life.